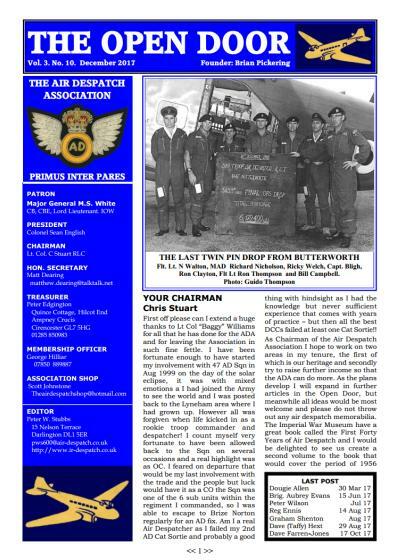 The Association developed from the Air Despatch Club, founded by Brian Pickering in 1985. Brian was discussing the idea of an Air Despatch Reunion with Carl Kingham, who then encouraged Brian to, “have a go”. Brian then approached Ian Gutteridge, who was at the time at South Cerney. Ian was very positive about the idea, and Brian went ahead tracking down old Despatchers. The first Club Reunion was held at South Cerney on 26 October 1985. The designation “Club” was decided on so as not to cause any conflict with the RASC/RCT Association, as it was an informal organisation. Nine reunions were held before the Club became constituted as the Air Despatch Association in 1994. The Association is affiliated with the RASC/RCT Association. Membership of the Air Despatch Association is open to service personnel of all ranks who have been on the strength of an Air Despatch unit of the British Army. You do not need to have been a Despatcher, you may have served as a Clerk, Cook, Mechanic etc. A newsletter,shown left, and appropriately entitled “The Open Door” is published and sent to all members. The content is a mixture of news and stories from members. There is an annual reunion, where you can meet up with old comrades and of course make new friends. Annual membership is £10.00, Life Membership is £60.00 . Full details from the Membership Officer, or download an Application Form.